Marge: I have an idea. Homer: What? What’s your idea? Marge: When my father was first trying to catch my mother’s eye, he sent her a box of candy with his photo in it. After that, she never forgot him. Homer: That’s all well and good, but it’s not really YOUR idea, is it now? 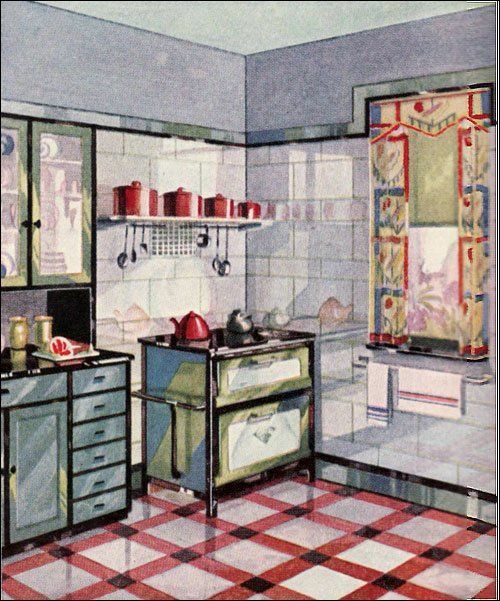 A while back, I ran across this image from a vintage Vitrolite ad, and I fixated on the wall tile pattern. I liked how it was both a staggered and a straight pattern at the same time, and how I hadn’t seen it on Pinterest. MINE, ALL MINE!!!! Despite all new walls, large-format tiles will tend to exaggerate anything not square or perfectly flat. More fundamentally, the 4 x 12 tiles were actually about 4.25 x 12.75 inches, while the 9 x 12 tiles were pretty much 9 x 12. They wouldn’t line up. Oh, woe! I dragged my depressed self around the tile section in hopes of a new solution. I found one, and all I had to do was dial down my expectations. I could still follow the same basic pattern — row of large tiles, offset row of subway tiles, etc. — if I used square tiles for the “large” row. 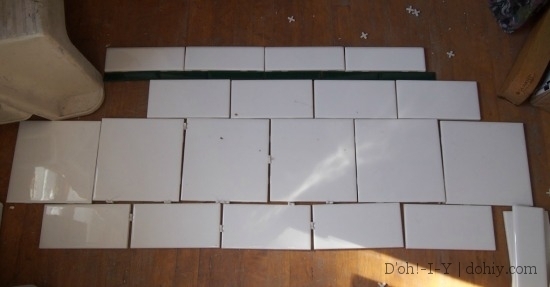 Reinvigorated, I bought out the store’s entire stock of white 6 x 6″ and 3 x 6″ tiles. We wanted to have a contrasting liner tile, and had dark green in mind. 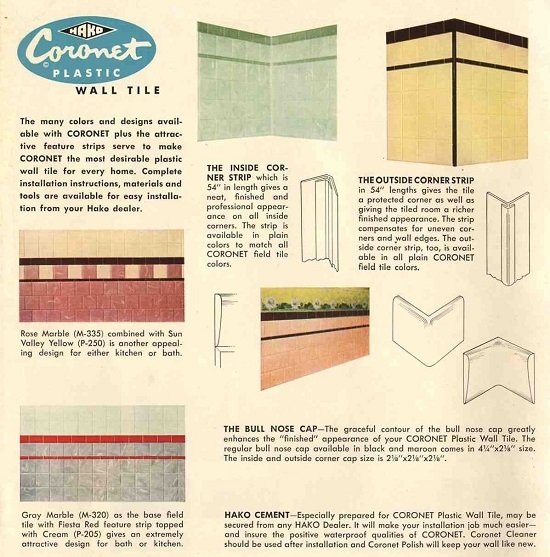 I was surprised at the cost of many liner tile options. I may be super-cheap, but roughly a buck an inch seems like too much for a silly accent tile. Intent on cheapness, I ran to ebay and bought vintage dark green liner tile: under $40 for enough to go around the whole room. The liner tile is cool. It’s got a slight bevel and I like the color. It’s new old stock 1950s plastic tile, and came in its original box with most of the tiles still wrapped in bundles. PLASTIC?! 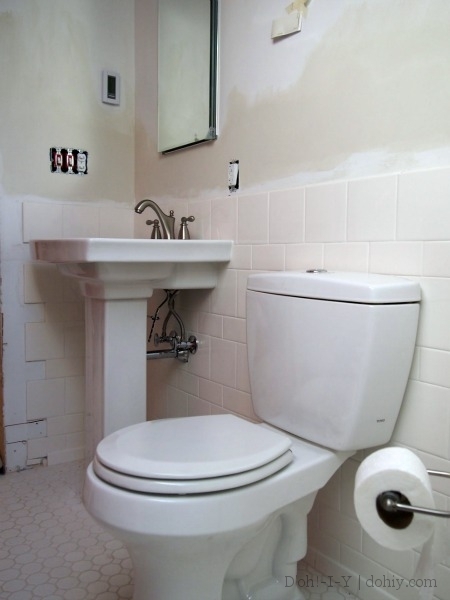 Well, yeah, but my thought was it would look just like ceramic tile when installed. The problem: it’s practically flat compared to ceramic tile. We would have to have furred out under the plastic tile somehow to make it look right. Hurrah, I’m going to have to re-sell it! Instead, I ordered Interceramic liner tile from Lowes in the right color (and material). It’s not $40 for the whole room, but come on. It’s the right thickness and it’s a nice (darker than shown) green, so on the wall it went. I finished above the liner tile with white 6-inch bullnose. Here’s my stolen tile pattern in process. 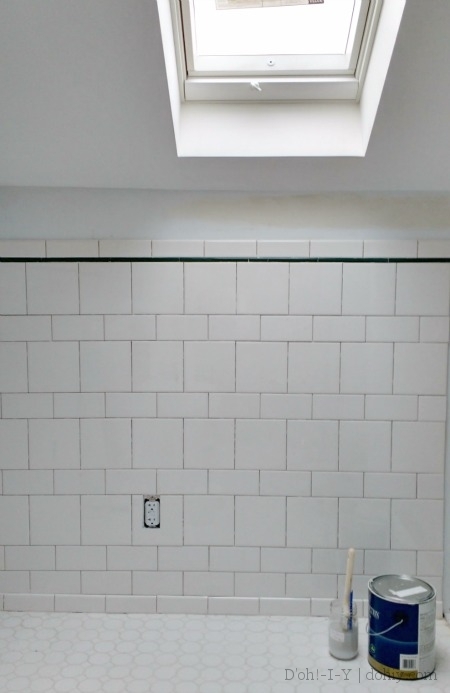 I’m not the best tiler the world has ever seen, but I am using white grout, which is going to blend in and minimize any amateur effect. Here’s one with the liner tile in place. Make sure that your tiles’ actual size works for the pattern. The nominal size (what is says on the package) might not be the real size. You also need to allow for grout lines (not a problem if the tile sizes work and you use consistent spacing). Use a long level to make sure that the horizontal and verticals are all lining up row after row. This pattern isn’t hard to do, but the look relies on the tiles lining up. Plan so tiles at edges and corners aren’t tiny slivers. Your walls might not be perfectly square, but if you have more to work with, it won’t be as obvious if you have to taper a bit to keep things straight. I thought I had the tiling done except for a Big Grouting Weekend when Kev reminded me that the shower door is six foot tall. 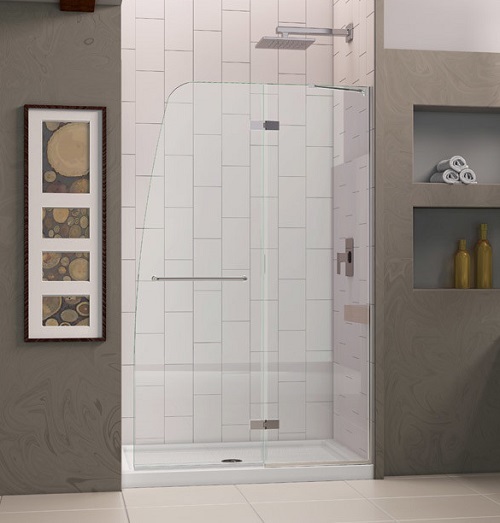 Aqua Ultra Hinge Shower Door — we got ours from Wayfair, and it’s well worth signing up for their sale emails and lying in wait for the best price. Channel for door will be on the right edge. Currently, the channel would rise past the tile, meaning there would be a tile-depth gap for the last few inches. It just seems like the gap is going to make the door look shoehorned in. Right? HEY, I HAVE REAL PROBLEMS TOO, I JUST DON’T BLOG ABOUT THEM! 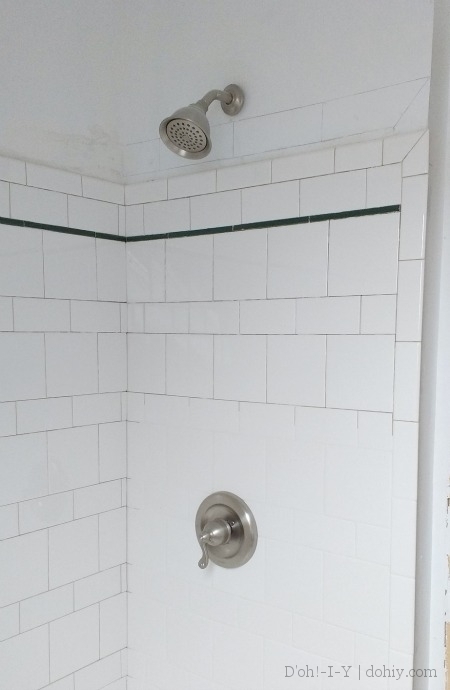 Is it worth ripping off bullnose and bringing the shower tile higher? Instead of making a decision, I stopped working on the bathroom and started on the closet. If I let the issue roll around in my head, I’ll reach a decision. I will probably redo it, but I might be convinced otherwise. Kev’s certainly trying. 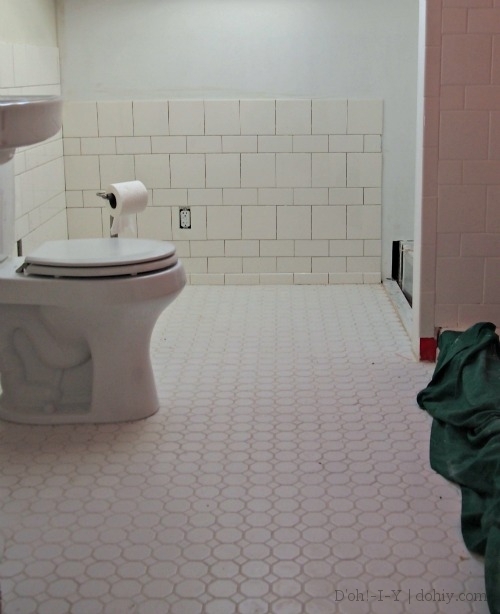 This entry was posted in Bathroom, D'oh!, Decor, Salvage, Walls & Floors and tagged mixed tile patterns, subway tile patterns, vintage tile lay-out, vintage wall tile pattern. Bookmark the permalink.